January is National Stalking Awareness Month and this week's announcement by Civitas Media, that it was constructing a national database of concealed handgun permit holders, couldn’t have come at a worse time. This is quite a service Civitas will provide stalkers with. Before a stalker decides to go after his or her intended victim, they need only look up whether the victim can defend themselves. Civitas has nearly 100 publications in 11 states and a circulation of 1.6 million. One of the main benefits of concealed carry is that criminals don't know until they attack whether a victim is able to defend herself. Thus, people who would never think of owning a gun, let alone carrying it with them, benefit from the fact that others are willing to do so. One of the main benefits of concealed carry is that criminals don't know until they attack whether a victim is able to defend herself. Civitas’ database takes away that benefit. Civitas might think they will embarrass gun owners by outing them, but making names public is a public safety issue. Even New York in its new draconian gun law last year included a clause banning newspapers from publishing the names and addresses of gun owners. . . . 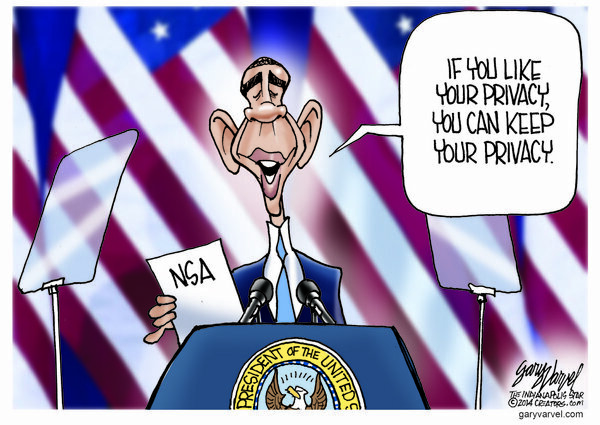 Comic: Obama: "If you like your privacy, you can keep your privacy"
The Ukip leader has said it is party policy for hand guns to be legalised and licensed in the UK despite being banned in the UK for the last 18 years. Speaking on LBC Radio Mr Farage said that it was Ukip policy to create a “proper licensing policy” and that people who kept hand guns responsibility locked up and had were willing to get an official license should “absolutely” be allowed them. Peter Squires, professor of criminology at Brighton University and a member of Association of Police Officer’s advisory group on the criminal use of fire arms said that Mr Farage’s comments were "irresponsible". . . . Question: When early voting is created or extended what impact does it have on political races? I was looking at the Presidential Commission on Election Administration report and noted their discussion on early voting. Just some thoughts: most campaigns, particularly those of challengers, try to wait until near the election before they spend their limited funds on advertising. What impact does early voting have on how well informed voters are? Does early voting increase the re-election rate for incumbents? Does it change the rate that Democrats or Republicans win election? "Robert Wood Johnson Foundation finds less than 40 percent of uninsured adults will obtain coverage in 2014." Saying only 39 percent of those who are uninsured will get insurance isn't very good news, but the numbers are even much worse than that. This number is extremely misleading in that there is a large flow in and out of uninsured each year. The government's survey of uninsured is just for people at one point of the year (March). Many of these people are uninsured while they are switching jobs. The bottom line is that the 40 percent number is pretty meaningless as a measure of how things are improving unless you take into account the normal turnover and that turnover is around 40 percent. Will Obama push gun control in his State of the Union Address on Tuesday? In his 2013 address, Obama called for a vote on gun control legislation . . . .
None of that got done, opening the possibility for plenty of recycling in Tuesday’s speech. Gun control seems the least likely to be a repeat. It’s not an issue that would help Democratic Senate candidates or incumbents running in Alaska, Arkansas, South Dakota, West Virginia or Montana. . . . Given how much Obama pushed for gun control AND has continued to push for it up until very recently, I have a hard time believing that he will let the issue drop. On the other hand, the polling support for more gun control is weak. If he pushes for it despite these political costs, it will help show how fixated he is on the issue. Of 11 subcompact and minicars subjected to the Institute's small overlap crash test only one, General Motors' (GM, Fortune 500) Chevrolet Spark, did reasonably well. Six of the cars earned the Institute's lowest rating of "Poor." Those were the Nissan (NSANF) Versa, Toyota (TM) Prius c, Hyundai Accent, the Mitsubishi Mirage, Chrysler Group's Fiat 500 and the Honda (HMC) Fit. The Mazda2, Kia Rio, Toyota Yaris and Ford (F, Fortune 500) Fiesta were deemed Marginal, the second-worst of four possible ratings. Most of these cars have done well in the Institute's other crash tests and in government tests. The Insurance Institute is a private organization financed by auto insurers. The Spark earned a rating of Acceptable. None of the cars earned the top rating of Good. . . .
New York Times' Jill Abramson says that Obama administration "the most secretive White House that, at least as a journalist, I have ever dealt with"
Let me move on to another topic in the Obama administration. How would you grade this administration, compared to others, when it comes to its relationship with the media?Well, I would slightly like to interpret the question as "How secretive is this White House?" which I think is the most important question. I would say it is the most secretive White House that I have ever been involved in covering, and that includes — I spent 22 years of my career in Washington and covered presidents from President Reagan on up through now, and I was Washington bureau chief of the Times during George W. Bush's first term. I dealt directly with the Bush White House when they had concerns that stories we were about to run put the national security under threat. But, you know, they were not pursuing criminal leak investigations. The Obama administration has had seven criminal leak investigations. That is more than twice the number of any previous administration in our history. It's on a scale never seen before. This is the most secretive White House that, at least as a journalist, I have ever dealt with. . . .
72% of affluent baby boomers believe Obamacare will cover long-term health care needs in retirement. Boy, are they in for a surprise. Nearly three-quarters (72%) of "affluent baby boomers" believe the Affordable Care Act will pay much of their long-term heath care needs in retirement and are "not adequately planning" for long-term care costs or "not planning at all, according to data from Nationwide Insurance. . . . The federal government covers some costs, through Medicaid and Medicare (40% and 23% for post-acute care, respectively, Heritage says), but the rest comes out of the pockets of consumers, directly or through long-term care insurance payments. What makes this particularly sad: Nationwide says 54% of boomers would "rather die than live in a nursing home," primarily because they don't want to financial burden their families. . . .
Will Obamacare destroy the health insurance industry? : Was this the plan all along? Moody’s announced Thursday it was downgrading its outlook for health insurers from stable to negative based on uncertainty related to ObamaCare. 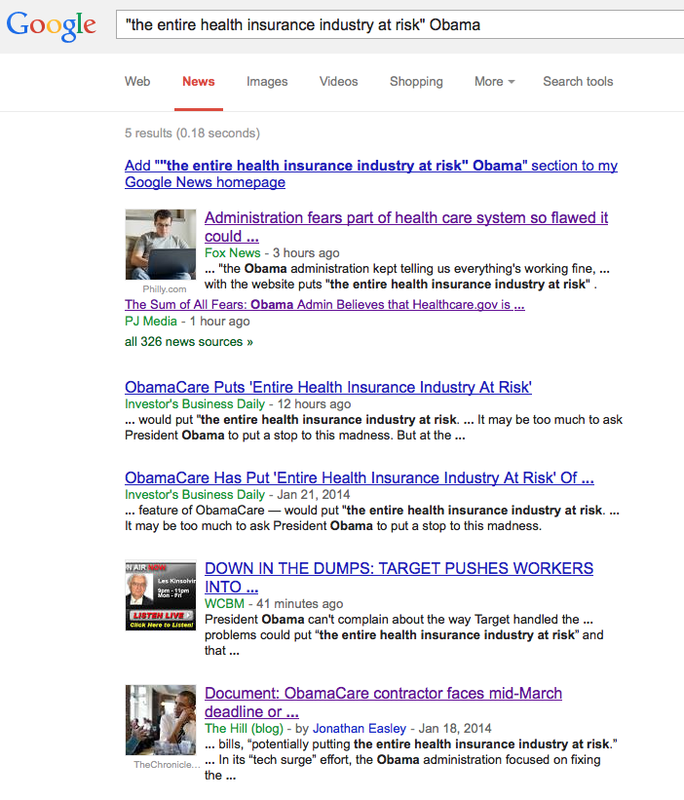 The credit rating agency cited an unstable environment because of the healthcare law’s difficult rollout . . . . The Moody’s report also cites the slow enrollment of young people into ObamaCare as a reason for the downgrade. “Uncertainty over the demographics of those enrolling in individual products through the exchanges is a key factor in Moody’s outlook change,” the ratings agency said. Citing statistics released by the administration, it noted that so far about 24 percent of enrollees are between the ages of 18 and 34, while a target of 40 percent may be necessary to keep premiums from rising in the future. It said the 24 percent of young people enrolled so far is “well short” of the 40 percent target. . . . The U.S. government needs more time to assess the Bitcoin "phenomenon" to ensure the virtual currency isn't used for unlawful purposes, Treasury Secretary Jacob J. Lew said. Lew, who leads the Obama administration's efforts to fighting illicit finance globally, said he discussed Bitcoin with JPMorgan Chase & Co. Chief Executive Officer Jamie Dimon and shares a "certain incredulity" about it. "We have to make sure it does not become an avenue to funding illegal activities or to funding activities that have malign purposes like terrorist activities," Lew said in an interview with CNBC today at the World Economic Forum in Davos, Switzerland. "It is an anonymous form of transaction and it offers places for people to hide." . . . So if Democrats know what they are doing on gun control, why is it that so few people approve of his job on that issue? A new Fox News poll shows that the approval/disapproval gap is bigger for Obama on gun control than it is on all but one other issue. 22 percentage points more people disapprove of Obama on gun control than approve of the job that he is doing. But heck, that is only one percentage point worse than it is for the job that he is doing on the economy, and we all know how well that is going. Even back in April when Obama was pushing hard for the Senate vote on gun control, his approval rating on this issue was only 39%. As President Obama starts his sixth year in office, his job ratings remain near record lows and more voters think his policies have hurt rather than helped the economy. And even as voters continue to hold mostly negative views on the economy and the direction of the country, a new Fox News poll finds they see some improvement. A third of voters say they like both Obama and his policies -- a dramatic drop from 47 percent who felt that way in October 2012. In addition, 62 percent now say they dislike the president’s policies, up from 51 percent the month before his re-election. Voters aren’t impressed with Obama’s economic policies: while 27 percent think they’ve helped, a 40-percent plurality says they’ve hurt the economy. And another 33 percent don’t think the president’s policies have made much difference either way. . . . . Does anyone think that metal detectors at Major League Baseball parks will make people safer? Entering a big league ballpark will be a bit like going through an airport by 2015.Major League Baseball has told its 30 teams they must implement security screening for fans by then, either with hand-held metal detection or walk-through magnetometers. "This procedure, which results from MLB's continuing work with the Department of Homeland Security to standardize security practices across the game, will be in addition to bag checks that are now uniform throughout MLB," baseball spokesman Michael Teevan said Tuesday. The Seattle Mariners announced Tuesday that fans entering Safeco Field will have to walk through metal detectors starting with this year's opener. Boston, the New York Mets, Oakland, Pittsburgh and San Francisco were among the teams that experimented with screening at times last year. Security gained more intense focus after three people were killed and more than 260 wounded in when two bombs were set off at the Boston Marathon finish line. . . .
Obama administration reveals it worries that Obama risks pushing insurance companies into "default and disrupting continued services and coverage to consumers"
“I didn't see the article I'm not aware of those statements,” Jay Carney said. . . . So here is the big question, why isn't the rest of the mainstream media reporting on this? The Hill newspaper first reported this. Does anyone really think that metal detectors at Major League Baseball will stop attacks? · A one-year delay of the employer mandate (which our own Ezra Klein has shown is critical to both coverage expansion and cost control). It seems unclear that this will ever go into effect, as the regulatory difficulties of tracking compliance are enormous, and enforcing it will trigger unpopular changes in working hours and other conditions for many workers. · Numerous extensions of enrollment and payment deadlines, even though these have led to consumer confusion. · Changes in the rules governing the “risk corridor” programs that cover excess losses at insurers, with more potentially in the works. This buys peace with the insurers, but is going to be incredibly politically difficult for the administration to defend when the costs become clear. . . .
· Spring 2015: Cuts to Medicare Advantage, which the administration punted on in 2013, are scheduled to go into effect. This will reduce benefits currently enjoyed by millions of seniors, which is why they didn’t let them go into effect this year. . . .
More than half a million Swedes now have private health insurance, showed a new review from industry organization Swedish Insurance (Svensk Försäkring). In eight out of ten cases, the person's employer had offered them the private insurance deal. In December, the queues in the Swedish health care system pushed the country down a European ranking of healthcare. "Why can Albania operate its healthcare services with practically zero waiting times, and Sweden cannot?" the report authors from the Health Consumer Powerhouse (HCP) organization in Brussels asked, albeit acknowledging modest improvements. "The Swedish queue-shortening project, on which the state has spent approximately €5 billion, has achieved some shortening of waiting times." . . .
"The target for maximum wait in Sweden to see your primary care doctor (no more than seven days) is underachieved only by Portugal, where the corresponding figure is 15 days," the report stated. . . .
Target Corp. announced on Tuesday it would no longer offer healthcare coverage to its part-time employees. In a blog post on the company’s website, Jodee Kozlak, the executive vice president of human resources, framed it as a positive development for part-time employees of the company. “The Health Insurance Marketplaces provides new options for healthcare coverage that we believe our part-time members may prefer,” she wrote. “In fact, by offering them insurance, we could actually disqualify many of them from being eligible for newly available subsidies that could reduce their overall health insurance expense.” . . .
“Our decision to discontinue this benefit comes after careful consideration of the impact to our stores’ part-time team members and to Target, the new options available for our part-time team, and the historically low number of team members who elected to enroll in the part-time plan,” Kozlak continued. . . . Still, the announcement could reignite criticism over President Obama’s pledge that if you like your plan, you can keep it. . . .
Labor unions see the legal challenge as another attempt to weaken their influence and warn the disabled and elderly could pay a heavy price. “This is what they are trying to do: weaken the union,” said Flora Johnson, executive chairwoman of SEIU Healthcare Illinois and Indiana. “Unions will survive but the people with disabilities and other medical disorders, they might never recover. That is why we are fighting.” The case hinges on a Supreme Court precedent that says government employees who work at union workplaces must pay fees for collective bargaining representation, but not for the union’s political activity. If the justices rule that home care workers in Illinois are independent contractors rather than state employees, that could allow workers to opt of union representation and cut back on unions' sway. . . . It is actually pretty amazing that unions are seriously claiming that they are helping out the customers of their services. Unions raise wages and generally lower quality. They raise wages by restricting the number of people in the profession. Quality declines as unionized workers are very difficult to fire. So how do you think the disabled and the elderly would like lower costs and increased quality for the services that they need? her biography — a divorced teenage mother living in a trailer who earned her way to Harvard and political achievement . . . .
Davis did very briefly live in a mobile home and she briefly was a single mom working two jobs. But a lot is left out and incredibly misleading. Her second husband earned her way through her last two years at Texas Christian University and all of her time at Harvard Law School. Her second husband took care of her kids, even the ones from her first marriage (seriously!). she met Jeff Davis, a lawyer 13 years older than her, married him and had a second daughter. He paid for her last two years at Texas Christian University and her time at Harvard Law School, and kept their two daughters while she was in Boston. When they divorced in 2005, he was granted parental custody, and the girls stayed with him. Wendy Davis was directed to pay child support. “My language should be tighter,” she said. “I’m learning about using broader, looser language. I need to be more focused on the detail.” . . . Davis defended the accuracy of her overall account as a young single mother who escaped poverty, earned an education and built a successful legal and political career through hard work and determination. . . .
Wendy Davis' language "should be tighter"? If a Republican had done this type of misleading, they would be ravaged by the press. She escaped poverty by getting married to a 13 years older lawyer who paid for her way through college, took care of her children, and the man got custody of her kids because she was so focused on her own work. It is nice that she was worked hard enough to graduate from Texas Christian and get into Harvard Law School, but to say that her hard work got her out of poverty is a bit much, unless you include the dating market as your way of working your way out of poverty. As an aside, Sarah Palin was savaged by liberals for being governor and having kids -- that she wasn't able to give them the desired time even though her husband made up the difference. How often do women lose custody of their biological children to a husband who isn't the children's biological father? How often do women lose custody in any case, especially if they have a good paying job as a lawyer? It seems like more is going on here than Davis simply having spending all her time at work. 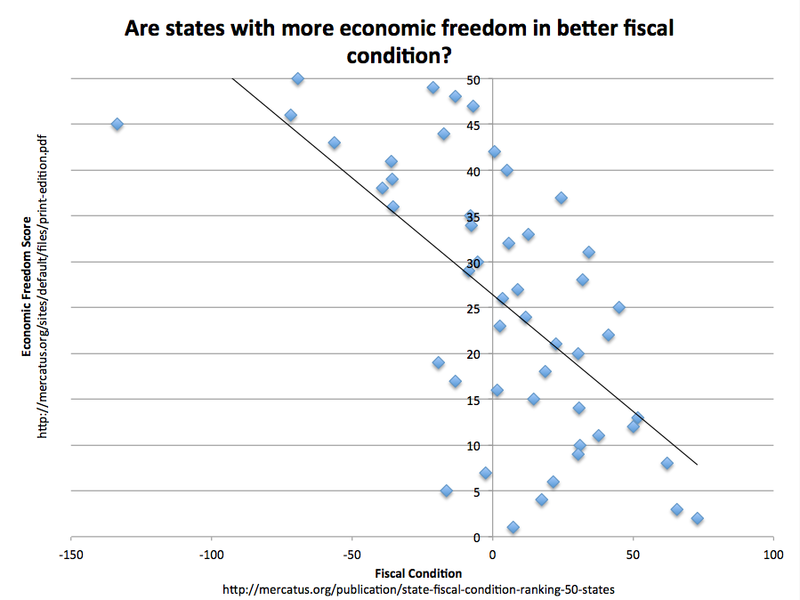 Are states with more economic freedom in better fiscal condition? The answer appears to be "yes." States with more economic freedom seem to be in much better shape fiscally. The Mercatus Center's measure of state Fiscal Conditions has been getting some attention this weekend. I thought that it would be interesting to see whether Democrats or Republicans have been doing a better job running their states, but it seemed easier to look at Mercatus' measure of economic freedom. The causation isn't clear, but there is a strong, statistically significant relationship between the two. Allison Barrie of Fox News discusses the different types of concealed carry guns that were being exhibited. I have had a previous post about women carrying guns here.
. . . Revolvers hidden in the handles of briefcases, ladies handbags, going Storm Grey, cutting-edge suppressors -- they're all meant to keep your weapon status on the QT. There were heaps of traditional concealed carry methods at the 2014 SHOT Show, but for those looking for holster-less options, here are a few that had attendees talking. . . . Need to carry a briefcase AND a firearm? No problem. K-Var’s solution is a briefcase with a revolver concealed in the handle -- which is arguably more "Get Smart" than 007, but cool either way. This option is part of a very limited release of three guns in .22 short with five shots. . . . If you’re trying to conceal a weapon on your torso, then shoulder holsters that restrict what you can wear can be a big challenge for women. Vendors responded to the growing women’s market, bringing to SHOT Show a wider selection of compression garments and purses designed for concealed carry. Undertech Undercover’s Bebe purse was getting a lot of attention from the ladies, for example. The new Bebe is a compact leather clutch that can be used with jeans or that little black dress. In addition to your lipstick and whatnot, it's made to fit compact semiautomatic pistols and small-frame double-action revolvers. The full-length zipper along the handbag’s upper rear edge opens to a lined compartment with an elasticized holster and for added security it has a locking zipper. Designed to keep a compact handgun available and quickly accessible for personal defense, it retails for about $180. The Bebe was just one of a proliferation of handbags for women and for guys looking for a concealment man bag -- the selection wasn't nearly as good as for the ladies, in fact. . . . This last week has shown real errors in Obamacare enrollment numbers. The Obama administration claims that 1.9 million people enrolled in October or November in states due to expanded Medicaid coverage, but actual Medicaid enrollment due directly to the ACA’s expansion of Medicaid was probably only about 190,000. The difference is that the Obama administration claimed people who were normally enrolling in Medicaid were counted in the Obama total. Even Glenn Kessler at the Washington Post has this headline: "Warning: Ignore claims that 3.9 million people signed up for Medicaid because of Obamacare." Multnomah County officials expect national health care reform to cut the county's medical bills, too. By enrolling jail inmates in nationally subsidized healthcare -- best known as "Obamacare" to both the President and his critics -- the county could bill the federal government for the cost of providing some of them medical care. County health department officials briefed Multnomah County commissioners on the issue this week. . . . The National Association of Counties is pushing other counties to adopt this policy as a way to shift their costs onto the federal government. The ACA’s significant expansion of health insurancecoverage has many important implications for counties, as county governmentsprovide the local health care safety net infrastructure, public health functionsand other health care services, as well as often govern, finance and operate localcoverage and enrollment programs. Counties also run and finance local jails, which are responsible for providing health care coverage for the approximately 13 million individuals who are booked into these facilities each year. . . . There is a specific ACA provision related to the exchanges that could significantly impact county jails, which states that “an individual shall not be treated as a qualified individual, if at the time of enrollment; the individual is incarcerated, other than incarceration pending disposition of charges.” This provision will likely allow eligible individuals in custody pending disposition of charges to enroll in a health insurance plan offered through an exchange prior to conviction, or maintain coverage if they are already enrolled. . . . Additionally, as counties are responsible for providing health care services for county jail inmates and the overwhelming majority of individuals in jails lack any type of health insurance coverage, this provision could potentially reduce county jail health costs. . . . While federal law does not allow for the reimbursement of inmate medical care under Medicaid, there is an important exception to this rule. Specifically, the exception states that federal financial participation (FFP) is permitted “during that part of the month in which the individual is not an inmate of a public institution.” 1 The Centers for Medicare and Medicaid Services has verified through guidance letters issued in 1997 and 1998 that this exception applies to incarcerated individuals once they are admitted as an inpatient in a hospital, nursing facility, juvenile psychiatric facility or intermediate care facility that is not part of the state or local correctional system. Therefore, if an inmate is eligible for Medicaid and is transported out of a correctional facility to receive inpatient hospital services, Medicaid can be billed to cover the cost of these services. . . . Thus counties are not just being advised on how to get the federal government to pick up the tab for their healthcare costs, but they are also being encouraged to handle any health care costs in what in many ways could be more costly than if the county jail took care of them itself. Here is a note from the Association of County Commissions in Alabama.
. . . Some national groups would like to see local county jails be enrollment centers for a new population that will become eligible for Medicaid benefits. While some county jails across the country have enrolled individuals leaving custody of the county jail as part of a re-entry program, it is not a requirement. Also, for these individuals to be eligible for enrollment for Medicaid benefits while they are incarcerated, they cannot be convicted of a crime or sentenced and awaiting transfer to state prison. They must be pre-trial inmates. These questions arise because the ACA will expand eligibility Medicaid benefits to individuals that are up to 65 years of age and are living at 133 percent of the federal poverty level. Individuals in this group of people may find themselves entering into the criminal justice system through the local county jail. While this group of people may be eligible for or enrolled in Medicaid, Medicaid will not pay for any medical treatment while the individual is incarcerated. . . .
Total enrollments may be some place about 200,000 to 300,000 versus the 3.9 million. If the national number of people in jail over the course of a year is 13 million and a quarter of the year is 3.25 million (October, November, and December), you need just a trivial percentage of them (between 6.2 and 9.2 percent) to sign up to cover the entire 200,000 to 300,000. So how big are the enrollment changes from prison and jail in the past de-enrolling people from Medicaid. The survey, published online today in the American Journal of Public Health, evaluated Medicaid policies from December 2011 to August 2012 at 42 state prison systems. According to the results, 66.7% of the prisons terminated enrollment and 21.4% suspended inmates from Medicaid when they were incarcerated. However, two-thirds of these prisons also helped prisoners reenroll when they were discharged. . . .
Rich and his colleagues questioned the policies to terminate coverage during incarceration as ACA provisions roll out. States with expanded Medicaid programs will cover all adults, regardless of whether they’re disabled or have dependents, up to 138% of the federal poverty level. Broader eligibility means more prisoners likely will be covered. But if their coverage is terminated, prisons can’t benefit from a 1997 federal law that allows Medicaid to cover inpatient care that inmates receive outside of the prison system, as long as they’re Medicaid eligible. . . . So what happens if other prisons and jails across the country have done the same thing? In 2012, there were 745,000 people in county jails and 1,484,000 in prisons. If just 13 percent of people in jail or prison get enrolled in Obamacare, that would give you 300,000. Even if just 5 percent are enrolled, would be 111,420 or more than a third of the top 300,000 estimate.